For the first time in Pope John High School history, the Tigers are headed to the division 4 state title game after dispatching Mashpee, 70-62, at the TD Garden on Monday, March 12. The Tigers (23-1) earned the right to compete against Maynard for the state title on Saturday, March 17 in Springfield. The come-from-behind win was a result of a 11-1 scoring run after the Tigers fell behind 61-60 with less than two minutes to play in the game. Spearheading the claw back was senior Michael Thompson, a duel athlete that starred in the Tigers past football season at wide receiver as well. His double-double of 14 points and 12 rebounds were instrumental in the team’s win, including his layup with under two minutes in the game that gave the Tigers a 62-61 lead they wouldn’t give up. Junior Mehki Collins was also important in the win, adding a team-high 23 points. Pope John’s Marques Bouyer (14) fights for a rebound. Pope John Cheerleaders celebrate the Tigers’ victory over Mashpee in Monday’s Div. 4 State Semifinal. Pope John’s Mehkhi Collins (13) drives to the basket. 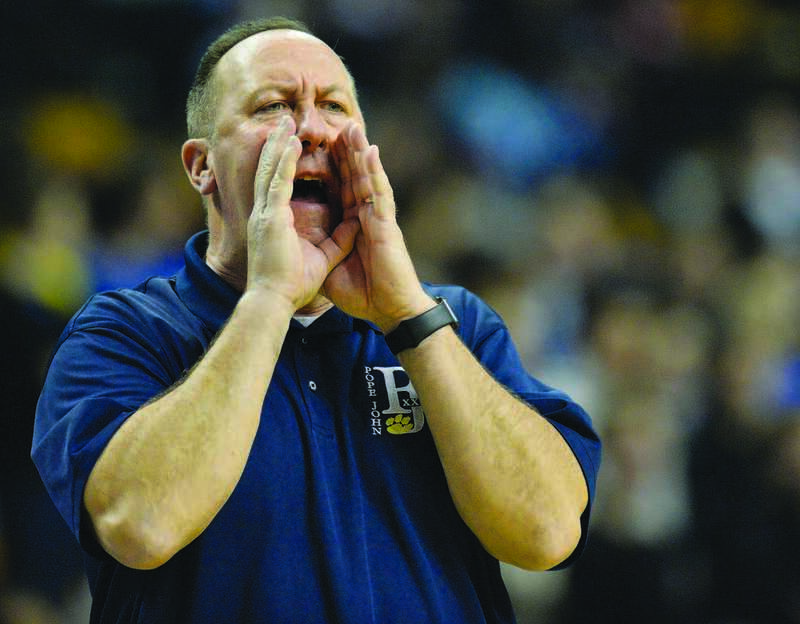 Pope John coach Leo Boucher shouts instructions to the Tigers during the Div. 4 State Semifinal win over Mashpee Monday in TD Garden. Pope John’s Cam Erickson (35) dives to the TD Garden’s parquet floor for a loose ball. Pope John’s Marques Bouyer (14) hauls in a rebound. Pope John’s Michael Thompson (1) contends with a pair of Mashpee defenders around the rim. Head coach Leo Boucher is looking forward to the opportunity, a chance to bring home the school’s first ever state title. The MassMutual Center is located in Springfield’s Downtown. Patrons should enter the MassMutual Center at the entrance on the corner of Dwight Street and Bruce Landon Way (Formerly Falcons Way). DIRECTIONS: Traveling West on Rt. 90, take Exit 6 off the Mass. Turnpike to Rt. 291. From Rt. 291 take Dwight Street Exit. Turn left at the end of the ramp and follow Dwight Street to the MassMutual Center.